Everyday, it’s a gettin’ closer! It sure feels like there are many irons in the fire right now. 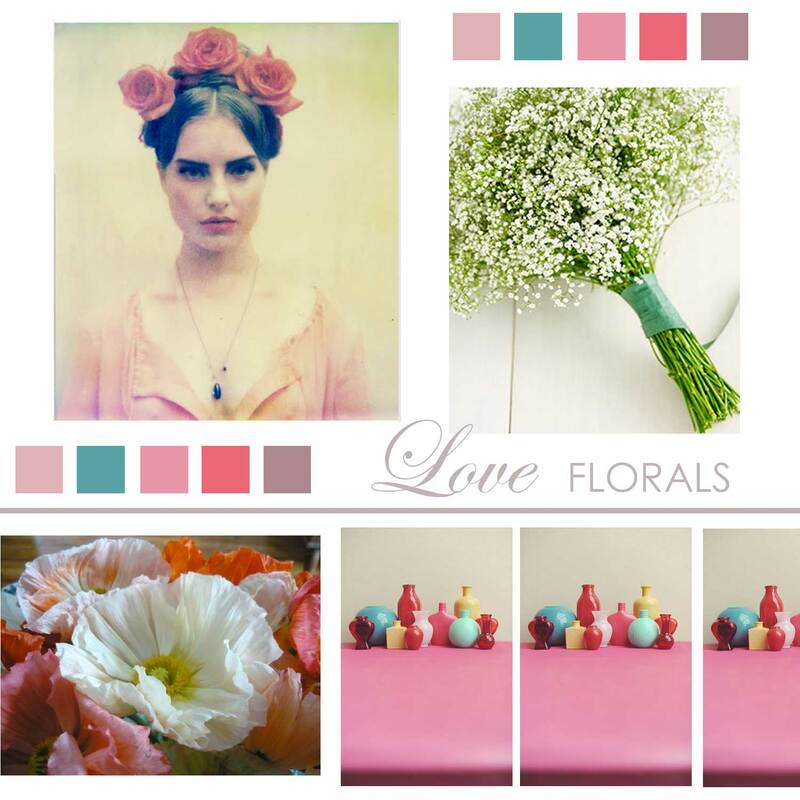 The 2012 wedding season is fast approaching and there’s lots to do! Besides creating layouts and assembling timelines, I’m working on a video DIY shoot tomorrow that I am excited to share with you, designing a baby shower for twins (it’s not ALL weddings around here…) and of course dreaming up some inspiration boards for clients. I just love the palette of magentas and burgundies popping off all shades of greens. I’m inspired by summer’s bounty of herbs, dahlias and vegetables like artichokes and kale. I’ll be displaying it all on wrought-iron cake plates, in moss covered pots and overflowing onto rich, dark, wood tables. 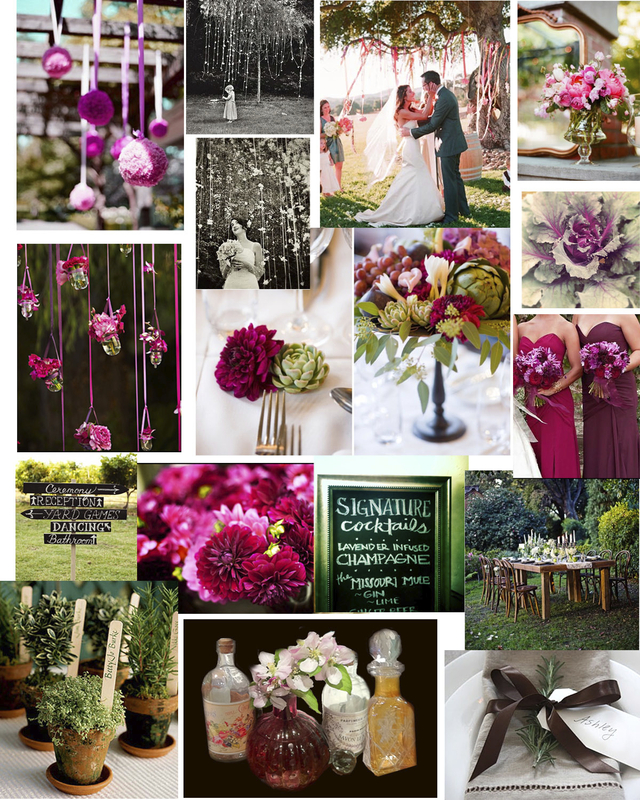 We’ll be hanging flowers from the trees and having fun with chalkboard signs – should be a blast! Here’s a little ditty that keeps me truckin’ along; I think you’ll enjoy! 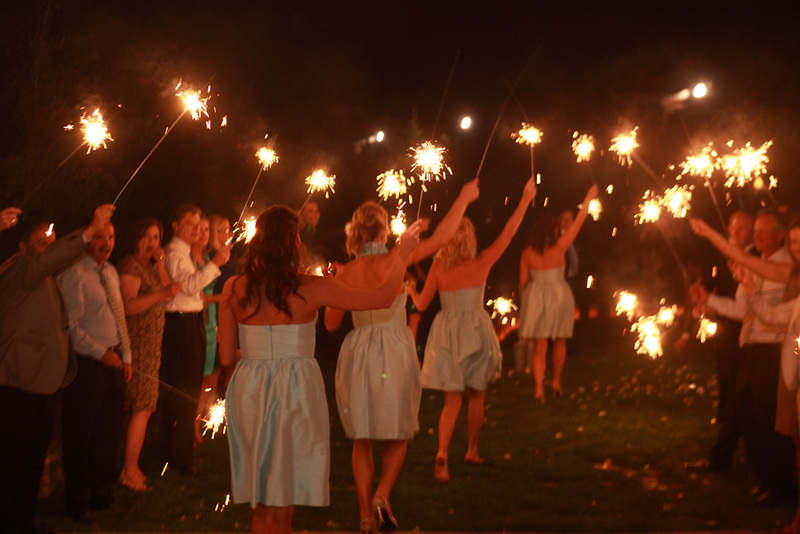 I have mixed feeling about sparklers at weddings. I also have scars from sparklers at weddings, so you can see why I have mixed feelings. Let’s get one things straight, I LOVE pyrotechnics, I LOVE fireworks and I especially LOVE lighting fireworks. Ask my neighbors, they know. But, I mostly love things that go boom (or spark) in the properly equipped hands. I know what you’re thinking, A rose petal send-off is boring and a bubble send-off is so 1985, I want some flare and flame and pizazz! Well let’s talk a little more harmless, less scar-inducing options, shall we? What about silly-string, I love that stuff! Or, how about glow sticks or customized paper airplanes! If your venue has a sweep-able send-off area, I’m a big fan on Flutter Fetti with its aerodynamic shape to float longer and enhance the flutter. It comes in custom colors too! Hooray! You could also have a musical send off. Grab a bunch of tambourines, bells, kazoos, maracas and noise makers and really go out with a bang! Now, that’s leaving the party in style!! 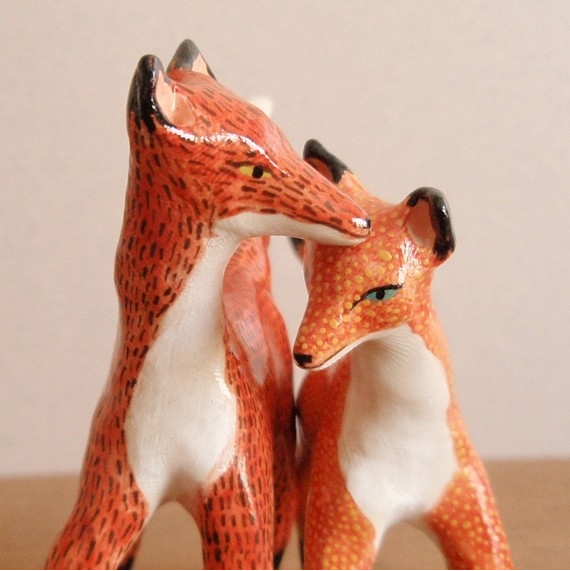 Dang, this foxy cake topper is the bees knees! Found it here. 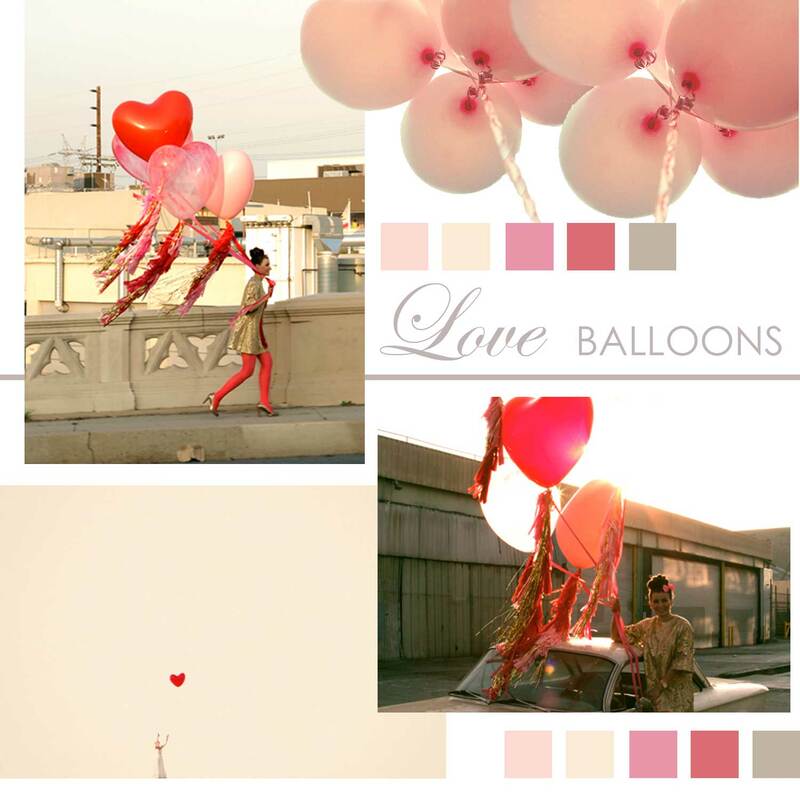 In the spirit of l'amour, I wanted to share a “La Vie en Rose” photo shoot I styled with you. It will surely get you in the mood for romance! Photos by Twin Lens Images. 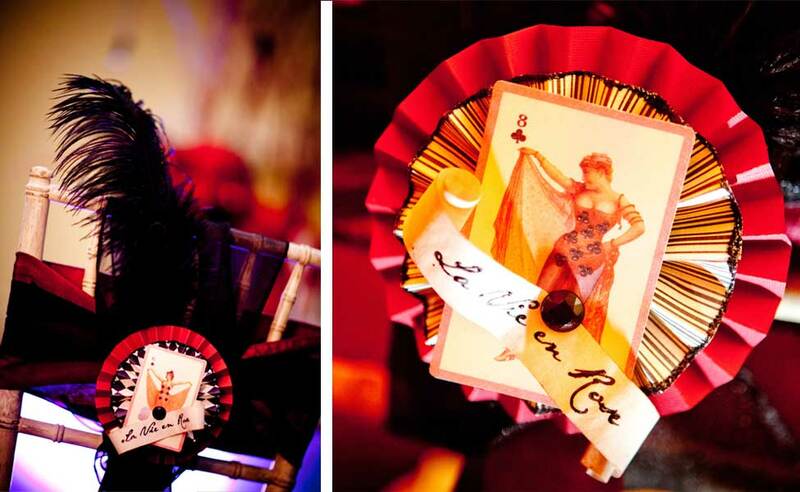 Be transported to the rich cabaret theaters in the heart of Paris. 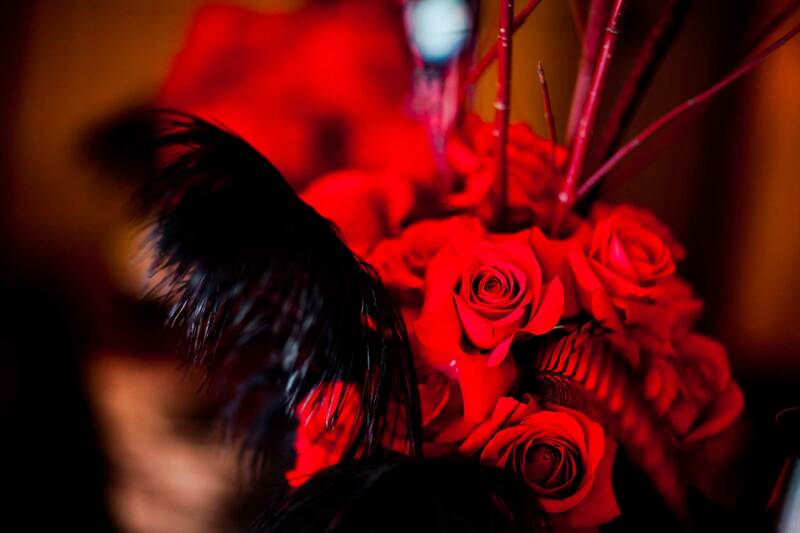 Reminiscent of the detailed costumes of the Moulin Rouge, and filled with the sparkle and shimmer of bubbling champagne, this display can be the perfect backdrop for an evening flooded with glamour, a romantic wedding or even a sultry bachelorette party. 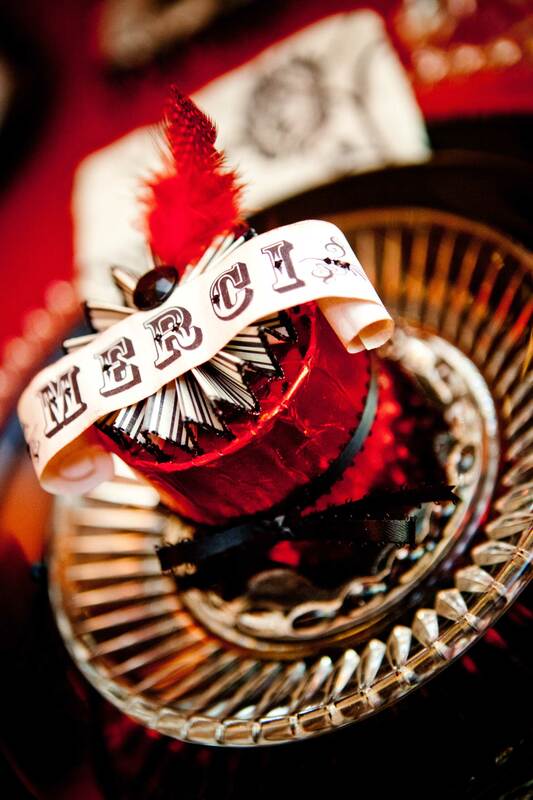 Be transported to the rich cabaret theaters in the heart of Paris. 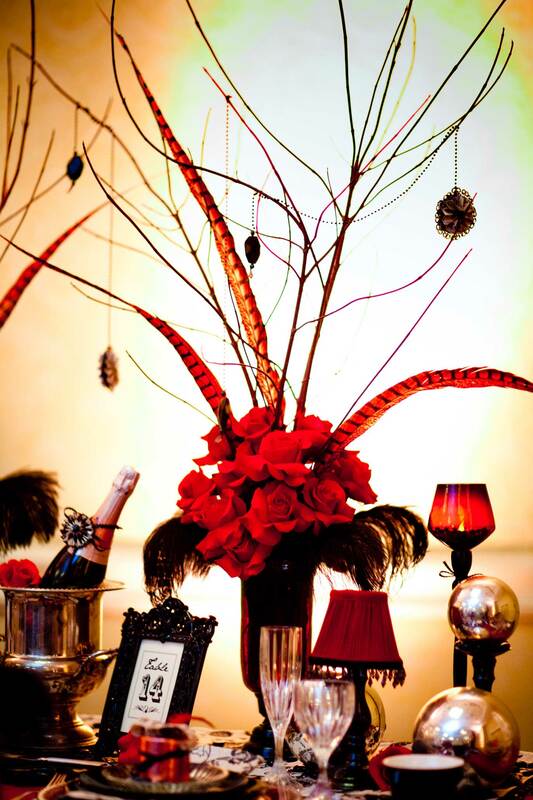 Reminiscent of the detailed costumes of the Moulin Rouge, and filled with the sparkle and shimmer of bubbling champagne, this display can be the perfect backdrop for an evening flooded with glamour, a romantic wedding or even a sultry bachelorette party. 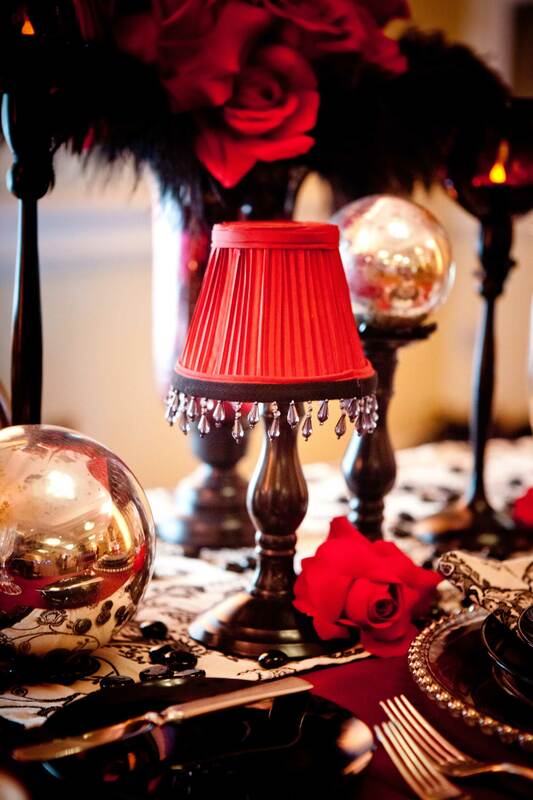 To echo the century-old cabaret style, I used deep hues of burgundy and rich reds accented with antique white and black for an old world Parisian vibe. I pulled out my favorite glue gun and assembled these adorable favors at each place setting. I tea stained the strips of paper to give them and extra-vintage feel and accented the paper rosettes with glitter, rhinestones and a red feather. Oui! Oui! I found the perfect beaded trim in the upholstery section to adorn my cabaret lamps and damask runner. Nothing a little beading won't jazz up! 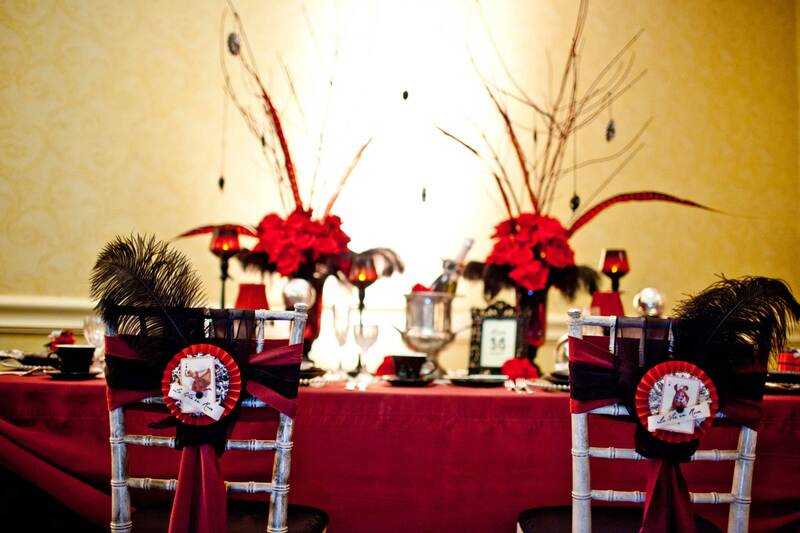 I found a set of vintage playing cards with awesome illustrations; I decided to adorn the chairs with rosettes featuring the “mademoiselle” cards and jet black ostrich feathers. 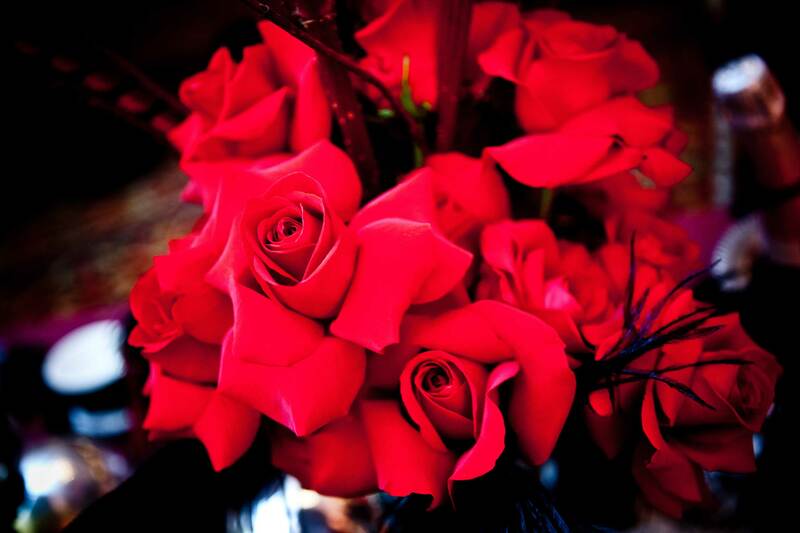 Wishing you all a romantic day today! Oh La La! I don’t know what it is about Valentine’s day, but as soon as February rounds the corner I go giddy for pink. I’m not usually that into this oh-so-soft shade, but I can’t seem to get enough of it, my eyes are drawn to it, I crave it! I’m a sucker for anything pink-give it to me! I even HAD to buy a neon pink brassiere the other day! Why? Cause it’s pink….and neon. So what am I doing for the ol’ V-day, you ask? Well, the mister and I rarely make any big plans. As I have been in the floral biz for the last 10 years, it is always a draining day. The last thing I want to do it get dressed and sit awkwardly in a restaurant full of couples. Not to mention, I am a total floral snob, where nary but a Peony will do. As a joke one year, the mister surprised me with the biggest bouquet of Baby’s Breath and Carnations that you’ve ever seen. It was HUGE! Oddly enough, there was something kitschy and nostalgic about it, that now, I secretly hope for every Valentine’s day! As an ode to the millions of pounds of sweets, gobs of flowers and bajillions of balloons that will be purchased this year, I’ve put together a sweet pile of my favorite treats. Enjoy the eye candy and I hope your Valentine’s is just LOVE-ly! 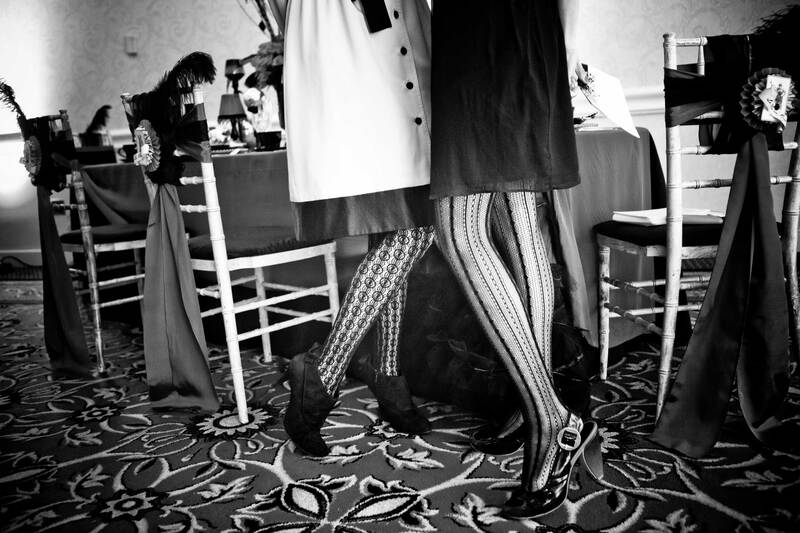 A wedding doesn’t always have to take place in the spring or summer. 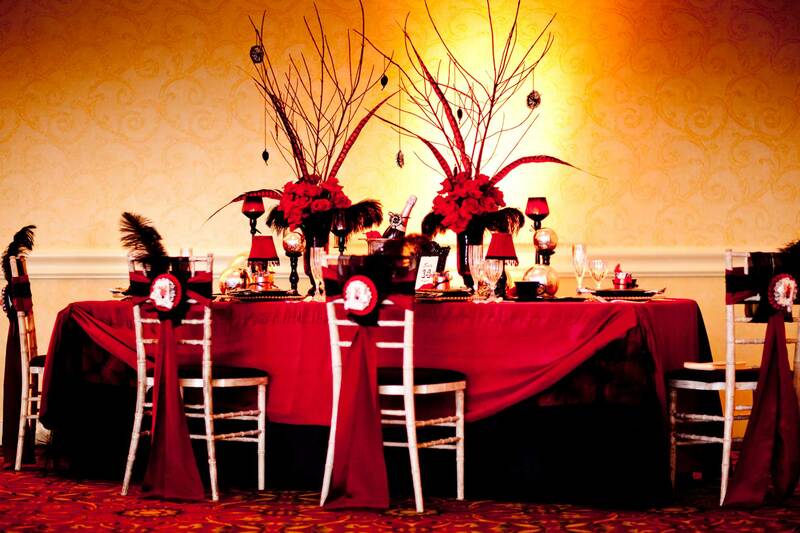 You can take advantage of the chillier months to get better deals on your venues and travel arrangements. 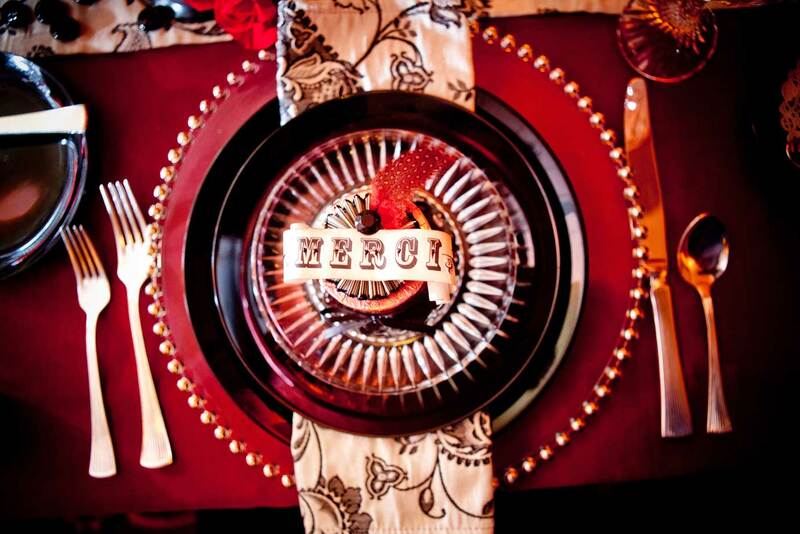 How romantic does it sound to host your nuptials in a cozy environment? I am inspired by the warm flicker on candles, cool color palettes, and lately, I am inspired by a set of antique laces sold in Santa Fe Fabrics. 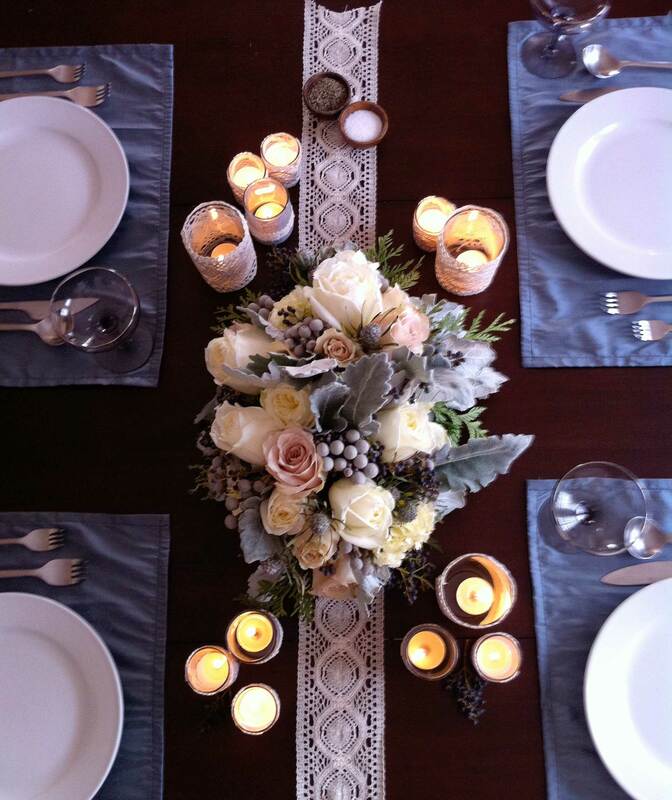 I decided to style a themed tabletop decoration in cream, silver, pewter, blush and currant colors, all revolving around the lace inspiration. 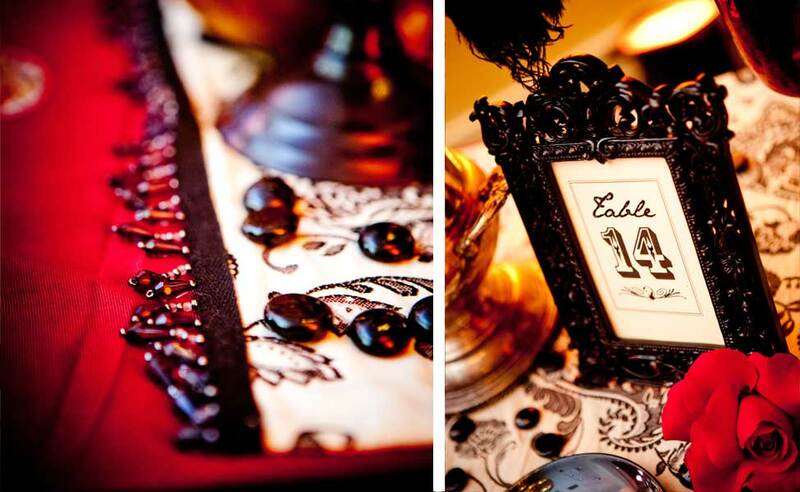 I have goose bumps over the dreamy, romantic and vintage vibe found atop of this table. It’s so good; you’ll want to gobble it all up! 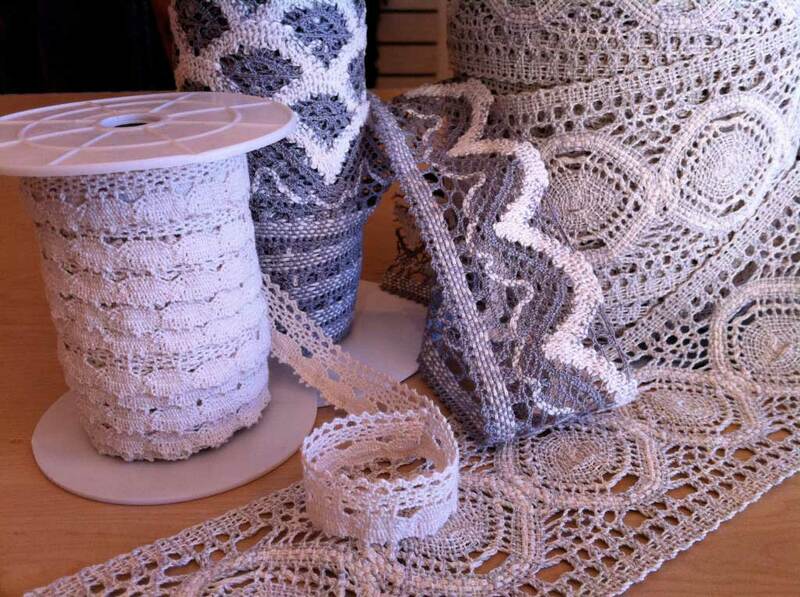 Now, lace certainly isn’t limited to sewing projects alone, it looks great on the table! 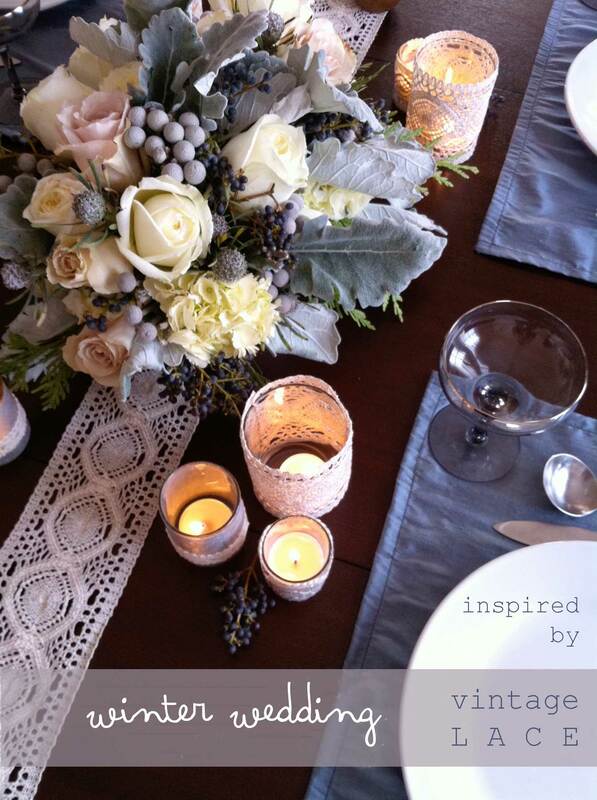 I love the look of a wide lace as a runner laid on top of a deep rich table-top. I just adore the look of the muted threads with the floral arrangement from Artichokes and Pomegranates made of Dusty Miller, Quicksilver and Polo Roses, Berzillia and Privett Berries. The laces found at Santa Fe Fabrics come in a variety of widths and shades, prices ranging from $2.10-$8.10 a yard. 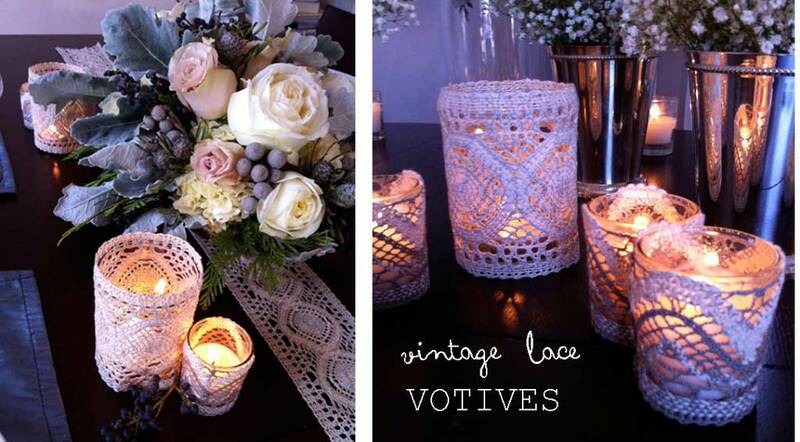 My favorite way to use the lace is to make beautiful vintage-looking votives. They are incredible easy to make yourself, just find a few glass votives and slather on some Modge Podge or other craft adhesive. Wrap the pre-cut lace around the votive and allow to dry. Voila! A beautiful trim to give the flickering glow of candles a romantic touch. (Hint, seal cut edges of the lace with a swipe of clear nail polish to prevent fraying.) 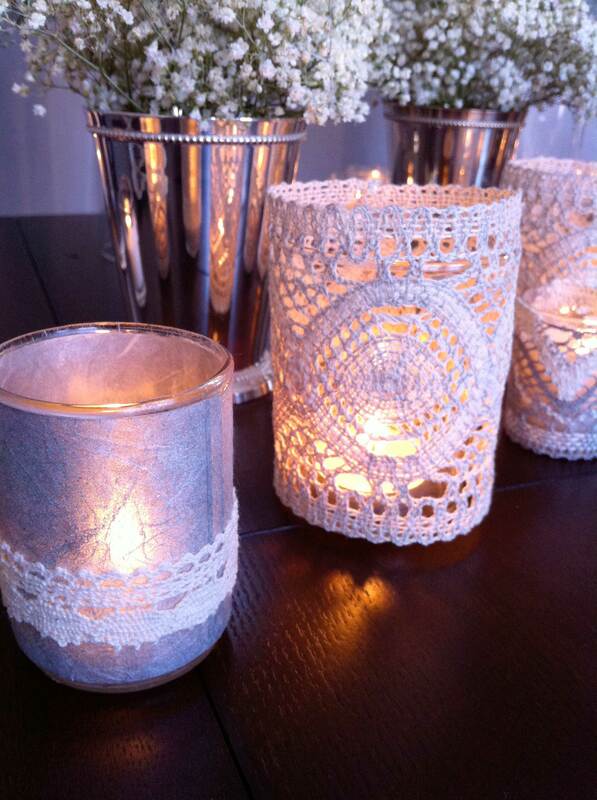 I also covered a few votives with silver tissue paper and then glued a thinner strip of lace on those. 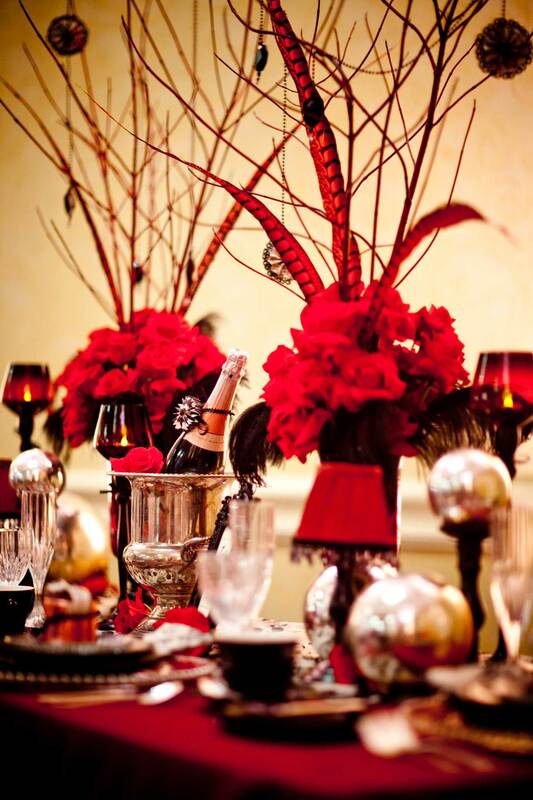 Little poufs of baby’s breath were places in silver julep cups to create softness on the tabletop. I’ll admit, I am a huge fan of this often-neglected flower when it is used all by itself. There is something sort of nostalgic about it, don’t you think? 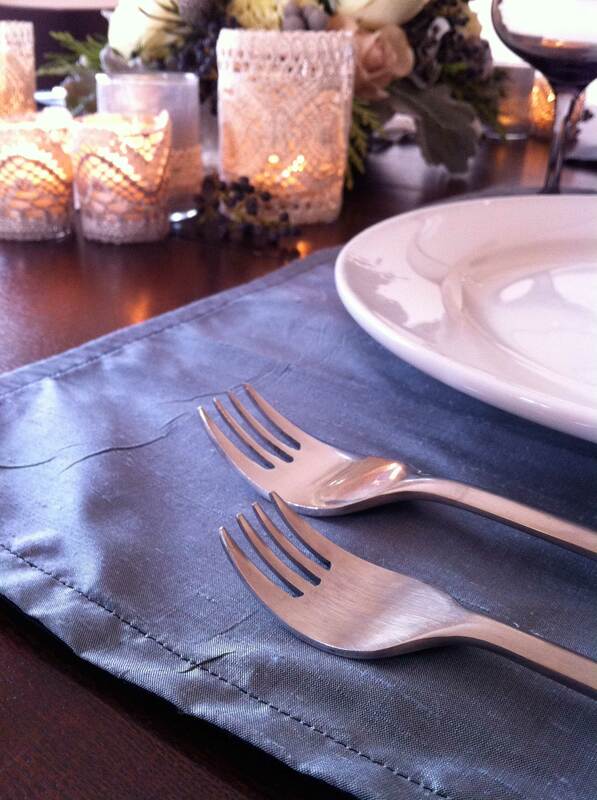 The place mats were created from the most beautiful pewter colored Duponi silk and added just the right amount of glamour. I purchased a few fat quarters and cut in half and hemmed, they easily make a perfectly sized place mat. 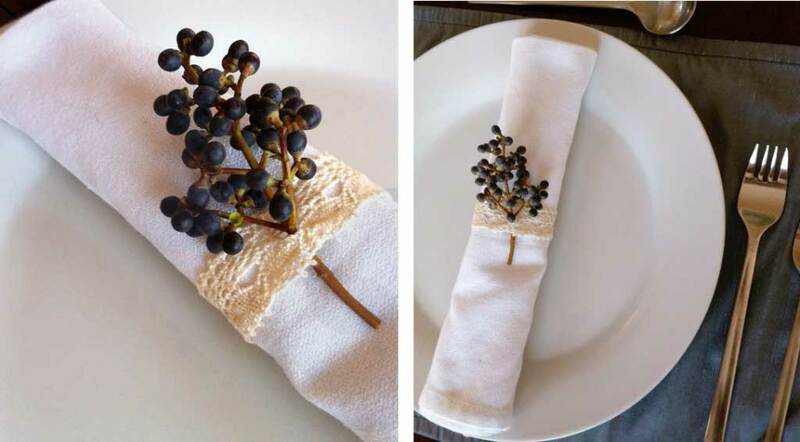 As a special touch, I used the thinnest width of lace to create napkin ties, accented with Privett berry for the perfect currant color pop. I hope you are excited for your winter tabletop decoration! I sure had fun styling it and thinking warm, cozy thoughts as the snow piled up this weekend! Cheers! 6 more weeks of winter, huh? I write this post as it is *dumping* snow outside and oddly it is sunny a the same time….only in Santa Fe. Well, I’m cooking up a little something to warm you up during this next few chilly months. 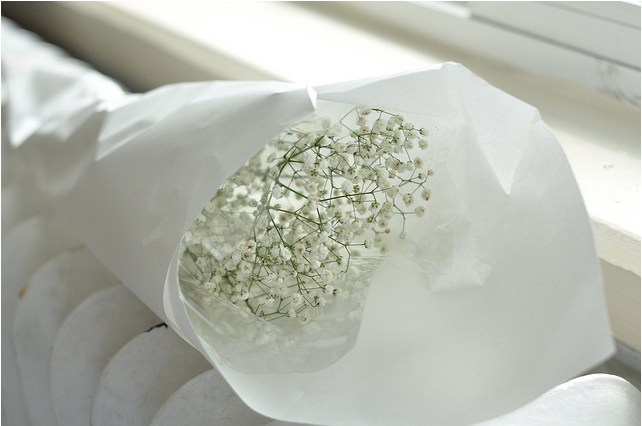 And, yes, it involves baby’s breath. Get excited people. 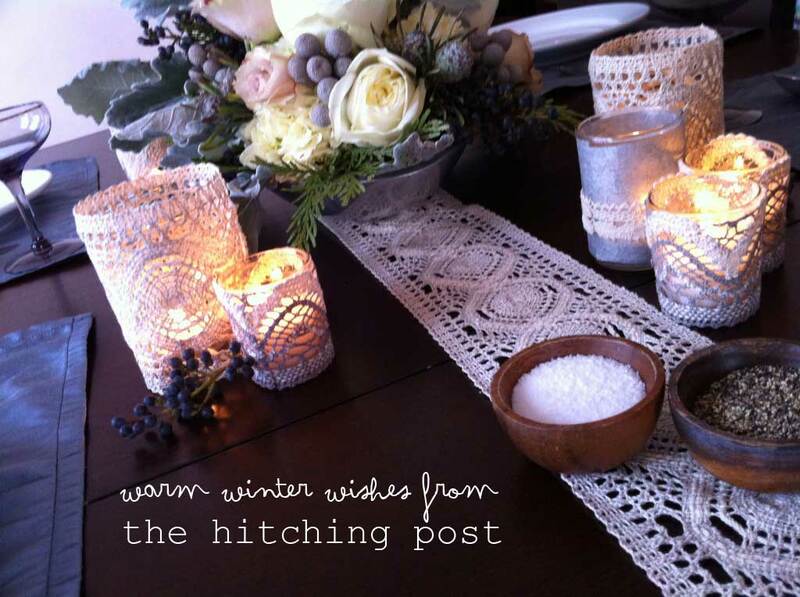 By the way, The Hitching Post is now on Facebook, c’mon by and give it a LIKE!